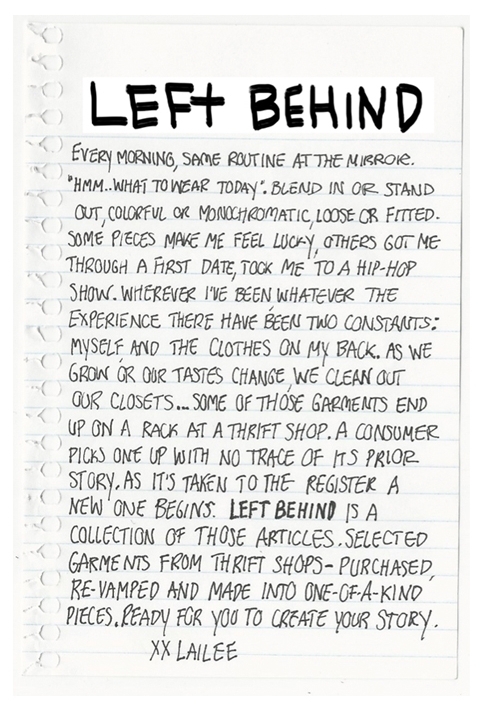 Left Behind is dedicated to bringing you quality one-of-a-kind pieces. Each garment is hand-crafted under the supervision of our designer from start to finish. Given the nature of vintage clothing & our NO RETURN POLICY, garment measurements are provided to create ease upon shopping. Please keep in mind that you are purchasing hand-crafted pieces and variations in color & texture are part of the creative process. We recommend washing your garments sparingly in cold water, inside out, and on a delicate setting (if not by hand). All garments have been washed at least twice, but if dyed, we recommend washing your garments separately the first few times to minimize the chances of bleeding. All pieces will be shipped VIA USPS Priority Mail. You will receive shipping confirmation & tracking information once your order is placed. But I'm sure you expected that, right? Sometimes it's love & hate though-I put something on that's been in my closet for years wishing it were a bit different; Fantasize about how if I could tweak this one thing the garment would be perfect for my current outfit. Ever have one of those days? I sure did. Thing is, working in the fashion industry in Manhattan didn't give me much leftover energy to use my creativity after-hours. So, chances are that piece of clothing was donated to charity, or ended up on a rack at a vintage shop. Then what? Eventually someone else picks it up, takes it home. Now it's theirs, but it's not new: it has a past. One that is unknown to the current owner. It's worn in, the color has faded after some washes, fabric stretched. It carries the memories of the times I've worn it, the places I've been, the people I've met; There's something nostalgic about it to me. So how did this all turn into Left Behind? Simple. I left my Manhattan fashion life to bring to you those pieces with a past, in a new way, ready for you to take on your future.